Ken Tribe used to speak of the “bootstraps principle”. He was a member of the first Music Board of the Australia Council in the early 1970s when it was developing policies for performance grants; his notion was that aspiring musicians should prove, to some extent, that they had the ability to realise a project before they could expect to be awarded a grant – in other words, pull themselves up by the bootstraps. Tribe was mindful of not wasting taxpayers’ money on ‘wannabes’. 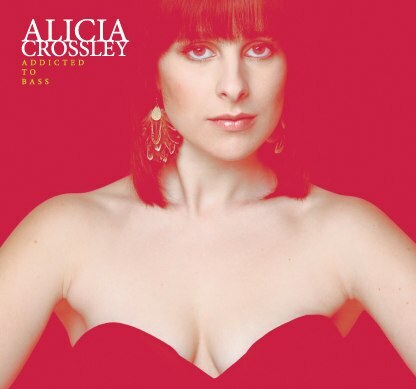 Alicia Crossley, bass recorder virtuoso, would successfully fill the bootstraps criterion with her CD, released in 2011. It is a totally admirable and imaginative enterprise, successfully achieved. 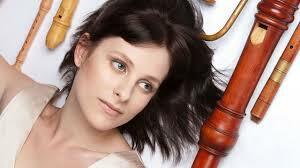 She approached seven young Australian composers, mostly graduates from the Sydney Conservatorium, to write for her and for other musicians. The result is a group of lively and inventive pieces that explore various extended techniques for an unusual solo instrument. As the Dust Settles by Tristan Coelho adds the vibraphone of Joshua Hill to the distinctiveness of the bass recorder. Interesting textures abound in this delightfully atmospheric, almost gentle piece which belies any difficulties for the performers. The strange name Calliphora refers to the common blowfly – possibly the first time that particular insect has inspired music. Composer Mark Oliveiro explains his rationale in the program notes, then says: ‘this work attempts to find beauty and interest in a subject most find abhorrent’. Several booms from the electronics made me think of whacking at a blowfly with a paper roll, but that may not be what Oliveiro intended. Virtuosic playing from the bass recorder and ingenious electronics have produced a most intriguing work (but it does not make me like blowflies any better). Electronics again partner the bass recorder in E by composer Andrew Batt-Rawden. E=ecstasy, not the drug but the concept of ‘being outside oneself’ or ‘in a state of transcendence of normal consciousness’. It begins in a contemplative way, building up in energy and intensity. This short work is under five minutes, but fascinating nevertheless. Canto-Fiato translates from Italian to ‘Song-Breath’, appropriately, as breath is essential for a wind instrument to make melody. 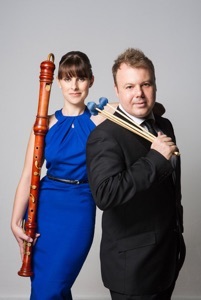 Composer Chris Williams has written for viola (Victoria Jacono) and percussion (Joshua Hill) with the bass recorder in a work where the ensemble is asked to play a “self-generating melodic figure, in rhythmic unison, but without any durational indications … the breath of the players coordinates the melody”. The result is an absorbing yet serene ten minutes’ of music. The word Doppelgänger translates as “double”. In this work by Elias Constantopedos the bass recorder not only doubles, it is at times transformed into a small orchestra, reminiscent of recorder consorts of the 18th century. Live electronics from Ben Carey are integral to the whole. It is an exciting piece, quite frenetic in spots and totally captivating. In Impulse Stream for solo bass recorder Alex Pozniak makes full use of the performer’s voice. Nervous stuttering from the instrument, vocal interjections, voice plus instrument simultaneously, singing and whistling extend the performer’s role in this intriguing piece. Fun sounds, spooky sounds, elements of humour and more permeate this brilliant bit of work. Night Seller Tissue Season by Hayden Woolf explores the “bleak world of illegal organ trade”. The rather unusual subject matter provides a scenario for what in some ways might be described as the most conventional-sounding work on the CD. From a quiet, gentle opening section, the piece gradually intensifies to a climax, with trudging piano sounds and police whistles. It is dramatic and moving. Soprano Anna Fraser, pianist Vatche Jambazian and bass recorder Alicia Crossley give superb performances. The CD was made with the support of Chronology Arts, a group established in Sydney in 2007 to provide professional opportunities for emerging Australian composers. Its two founders are Andrew Batt-Rawden and Alex Pozniak, whose music is featured on this CD. Integral to the whole are the skills of Adam Wilson who has expertly recorded and mastered each of the works. I scoured the written material for a disc number but there is none, and there is no printed booklet. But this is a twenty-first century production and we are advised to put the CD into the computer in order to read the E-Program Notes. The advantage of this medium is that it provides an opportunity for a number of portraits of the glamorous Alicia as well as plenty of information about the music, composers and performers, although the inclusion of the text for Night Seller Tissue Season would have been welcome. Innovation, creativity and energy in this music make it endlessly fascinating and most enjoyable.